Release the parking brake fully before driving. 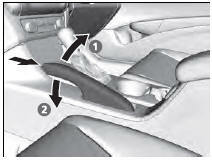 The rear brakes and axle can be damaged if you drive with the parking brake applied. 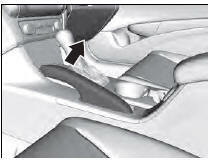 If you start driving without fully releasing the parking brake, a buzzer sounds as a warning, and RELEASE PARKING BRAKE appears on the multi-information display. Always apply the parking brake when parking. Check the brakes after driving through deep water, or if there is a buildup of road surface water. If necessary, dry the brakes by lightly depressing the pedal several times. If you hear a continuous metallic friction sound when applying the brakes, the brake pads need to be replaced. Have the vehicle checked by a dealer. Constantly using the brake pedal while going down a long hill builds up heat, which reduces the brake effectiveness. Apply engine braking by taking your foot off the accelerator pedal and downshifting to a lower gear. With manual transmission use a lower gear for greater engine braking. Do not rest your foot on the brake pedal while driving, as it will lightly apply the brakes and cause them to lose effectiveness over time and reduce pad life. It will also confuse drivers behind you.